Why the false spectre of bulk water exports is stopping Canadians from having an honest discussion about the resource itself. If you want to see water start a fire, suggest to a Canadian that their country should consider selling any of its very large water reserves – a fifth of all the Earth’s standing surface freshwater, and seven per cent of the planet’s continuously renewed water – to another country. Especially to its neighbours to the south. The hostility you’ll likely encounter reflects a quality in Canadians I call aquanationalism – the bonding of national identity with romantic images of clear lakes barely ruffled by a canoe’s passing, and the conviction that sooner or later the Yanks will come for our water. Unhappily, these ideas create a kind of cognitive dissonance that shuts down rational thinking about water at the sound of the word “markets.” This is unfortunate because Canadians badly need a mature conversation about selling our water. The need for such a conversation stems from numerous tributaries, so I’ll focus on just a few: humanity’s ecological overdraft; our national opportunity; climate change and our own ecological vulnerability. But also this: Canada already sells enormous volumes of water to the rest of the world. A trickle crosses the border in pipelines, flowing from Canada into Sweetgrass, Montana, and Point Roberts, Washington, for example, in just the sort of bulk export that alarmists claim (inaccurately) could be used to trigger a call option in NAFTA, putting all of Canada’s rivers and lakes up for American seizure. The reasons why it does not are somewhat technical, but the upshot is that no such demands have ever been leveraged off those decades-old and continuing flows. 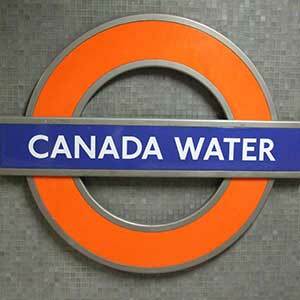 It helps that Canada’s water is nowhere in the future-supply plans of any U.S. state. Canada “sells” vastly more water embodied in commodities like beef or processed bitumen and in manufactured goods like cars and aircraft. This so-called virtual water is what’s required to produce those products. Water that’s used to make car parts isn’t available for other uses. Of course, that may be worthwhile if our society benefits as a whole from that tradeoff. Some of this water can be used again. Cattle, after all, pee. Plants transpire water to the air that falls later as rain. Some of it can’t: much of the water used to produce and dilute bitumen is effectively lost – either locked away underground or too toxified for re-use in the foreseeable future. And the volumes are mind-boggling. The Council of Canadians has estimated Canada’s net virtual water exports for all categories of product at 59.9 billion cubic metres a year. That’s roughly enough to empty Ontario’s Lake Simcoe every 72 days. On the day last year when Alberta’s bitumen production hit three million barrels, the water consumed was the equivalent of sending a virtual convoy of Exxon Valdez-size tanker loads of Canada’s water south – one every two hours. And even if Canadians would prefer not to think about those as water sales, the demands of the global marketplace, not just the United States, will make the subject unavoidable. The broad effect of climate change on the world’s distribution of water can be stated as “the wet get wetter and the dry get drier.” Wet Canada is in fact getting wetter: precipitation over our national territory is rising. But elsewhere, net declines in available water (the proper term is water yield: basically, precipitation less evaporation) are contributing to social and economic stresses, from the extreme in Syria or South Sudan, to the merely tense in Mumbai or the North China Plain. The drying out and the increasing wetness are both happening simultaneously, with an edge to the getting wetter, since warm air holds more water. But in very broad terms, the sub-tropics – roughly that band of latitude extending from Mexico City to Denver, and its southern counterpart – are getting drier. Places north or south of those, roughly beyond the 49th parallels, are getting wetter. Far more people live in the latitudinal band between Mexico City and Denver than do in the band in Canada between Vancouver and St. John’s. That’s not to say that the former are going to rush north and insist that the latter turn over their water. It’s much more complicated than that. It is to say that water will increasingly preoccupy the minds of Canada’s neighbours and NAFTA partners. They are going to need to talk about it, and Canada should not be a silent partner. The continental re-engineering feared by aquanationalists involving a continuous flow from the Yukon to the Chihuahuan Desert straddling the U.S.-Mexico border is a literal pipedream. There is not enough cement, energy or carbon budget to build such a monument. Nor money: cheaper alternatives exist to slake the thirst of Hollywood and Hermosillo. But the issue of fertile land turning to desert will not go away. And as one of only half a dozen countries in the world able to expand food production for export, Canada will face both a humanitarian obligation and a market opportunity. Of course, with each additional container of frozen pork we export, we also send more virtual water. Meanwhile, there is money to be made in the technologies that deliver water more cheaply than gargantuan canals – a lot of money. Currently, Israel and Germany dominate a global marketplace for water-related goods and services anticipated to reach $1 trillion (U.S.) by the end of the decade. Canada, despite its generous water endowment, is barely present. 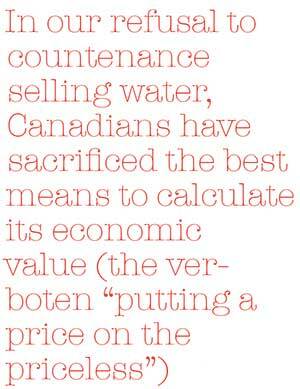 In our refusal to countenance selling water, Canadians have sacrificed the best means to calculate its economic value (the verboten “putting a price on the priceless”), and thereby denied ourselves the best motive and means for being careful how we use it. Canada is woefully, abjectly, lacking in comprehensive, real-time, consistent and granular data about its water supply, use or outlook. Despite local advances in a few watersheds, most authorities lack reliable metrics to support decisions about which water-reliant economic activities to promote or constrain. 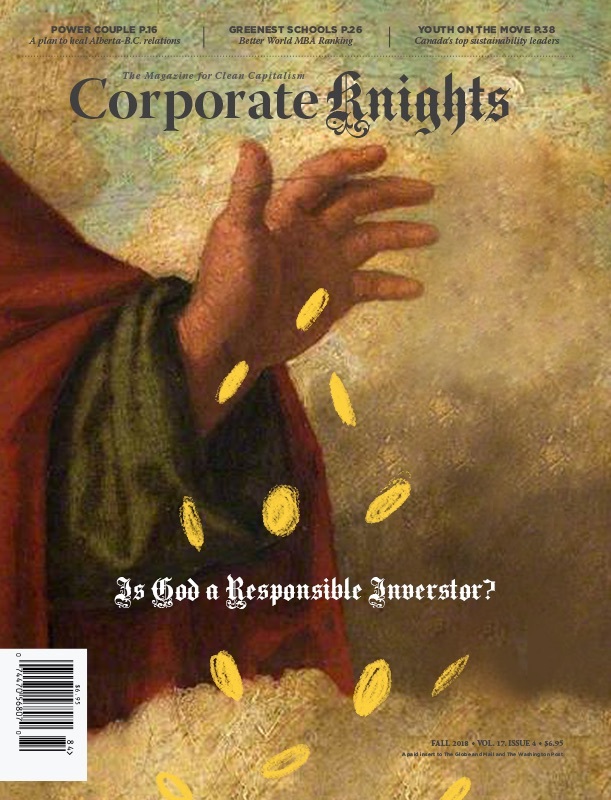 Companies lack metrics to reveal which innovations to bring to market. Investors lack transparency about those companies at greater risk of water-related shock than their competitors. And Canadians as a whole are left barely aware of a creeping but ominous risk. While Canada as a whole is getting wetter, the part where most of us actually live is getting drier, with its water yield declining annually by approximately as much as all of us use every year. A few regions, like heavily irrigated southwest Alberta and British Columbia’s Okanagan, are seeing the bottom of the water tank. Others, like southern Ontario, are running up against the same environmental overload of people against ecosystems as China, albeit on pocket scale. Even without the aquanationalists’ nightmare, we’re going to need to be very savvy about where and how we sell our water. Making those sales explicit, by putting a price on all of our own water use, is the best mechanism and motivator we have for keeping very close track of it: how much of it there is, how good it is, where it is and how much more of it we can expect. Canada will need to know all of those things even if we never let another bottle of liquid water leave the country.